The three founding members were: Faith Rein, Kathleen Seery, and Sandra Mayville. These three original members encouraged others to attend an introductory meeting at an artist’s home resulting in a beginning membership of about ten. From this small beginning, artists were drawn to the group and now number over 75 artists. We are a diverse group representing an interesting array of art mediums. The membership produces and presents work in watercolor, acrylic and oil painting, photography, wood turning, pottery, jewelry, three dimensional art (including gourds and masks), and much more. 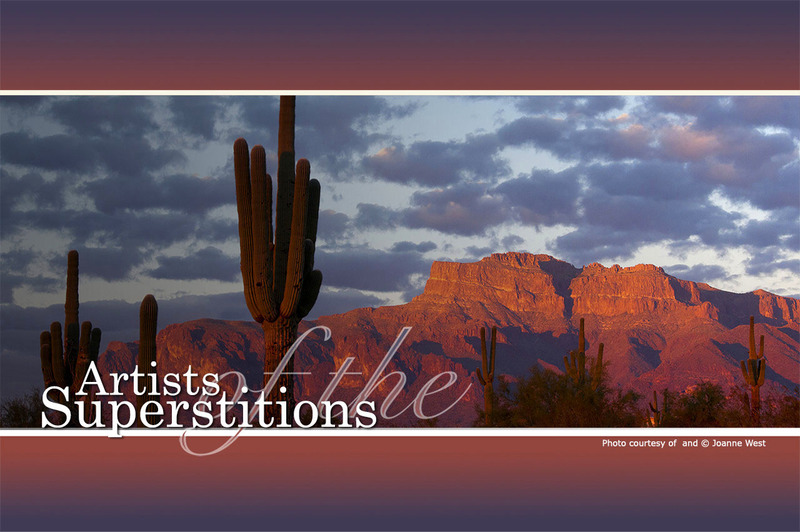 Inspired by the Superstition Mountains, the imposing landmark that is part of our daily lives, we changed the name of the group from the Gold Canyon Artists Group to Artists of the Superstitions in January of 2008. In May of 2008, steps were taken to further organize the group and a steering committee of five was established. This committee was formed from two of the founding members and an additional three appointed members. The structure will allow us to grow and increase the value of the Artists of the Superstitions to other artists and to the surrounding community. December 2010, AOTS was accepted into the Arizona Art Alliance, a consortium of Art Groups in the greater Phoenix area. The members will now be allowed to exhibit at more venues across the valley.